Account of Mrs. Mary Olive Peril who lived an eventful life, saw many changes in the nation, in her adopted State, and in the section of Texas where she spent most of her days. Mary Olive Locke, who later became Mrs. William A. (Billy) Peril, was born near Springfield, Illinois, on October 6, 1849. In 1851 the Locke family immigrated to Bexar county, near San Antonio, Mary Olive at that time being two years old. After her marriage to Billy Peril, she came as a bride to the Peril settlement midway between Kerrville and Harper. The Peril homestead was her home thereafter until death at sunrise on December 7, 1944. Here is her story. Account of old Charlie Small who was responsible for killing more Mexicans than almost anyone in Texas. "At times Charlie Small would come by and visit Uncle Mack and Uncle Jim, who I was staying in camp with or breaking a few ponies for. At times he would say: "Jim, did you ever shoot a Mex.?" Uncle Jim would say, "No, Charlie, I never had that to do yet." "Well," Charlie would say, "I shot one today, and they always jump right straight up and squall like a cat when you shoot them. I never let one get away when I find them alone." Story is that Rangers killed Small under the water tank at Langtry, but the writer of this story has his doubts. By Colonel M. L. Crimmins. Account of early incidents in the life of Major N. J. Jones, of Archer City, who was born in 1854, and joined Captain June Peak's Ranger Company in Throckmorton county in 1877. That company is credited with the killing of Arkansaw Johnson, Sam Bass' most trusted lieutenant, and capturing Pipes, Herndon and Jim Murphy, and they drove Sam Bass and his two surviving companions out of Northern Texas. Mr. Jones later served under J. W. Campbell. Second installment in an excellent and highly detailed four-part series of the fine service and notable exploits of Captain Ira Aten, a Texas Ranger and a peace officer during the 1880's and 1890's. The First installment contains great old photo of Captain Aten. By Dan Ferguson, Dallas, Texas. Great account of valuable history of Protestant worship in early Texas, particularly focusing on the early pioneer Methodists in Texas during the first half of the 1800's. Jesse Burnham, (in the early days the name was spelled Burnam), came to Texas with the first immigrants to Austin's first colony in 1821, from Duck River, Tennessee. He first settled at Pecan Point, and later moved to Fayette county, and ran a store at Burnam's Ferry on the Colorado river. Two of his sons, John H. Burnam and William Owen Burnam, were in the Battle of San Jacinto. Captain Jesse Burnam was a noted Indian fighter and frontiersman, and at the time he settled on the Colorado that section was constantly exposed to Indian depredations, and, the settlers being few and far between, he was compelled to rely mainly upon his own good right arm and his trusty rifle for protection against them. His body is buried near the old home, and the fifth generation of Burnams still live there at a beautiful spring shaded by immense pecan trees. His descend-ants, most of them, use the old name Burnham, considered the correct way of spelling it. Here is a brief story of the old pioneer. 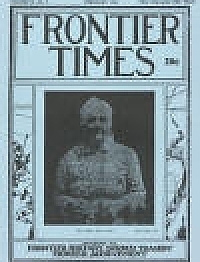 Account of Jack Miles, who was one of the colorful pioneer cowboys of the State. Born April 22, 1866, in Richmond, Ray county, Missouri, he was brought to Texas six years later by his father, the late Jonathan Miles, landowner, cattleman, and builder of West Texas towns. He grew up with a brawling and vigorous West Texas. His father, Jonathan Miles, who once owned most of the original townsite of San Angelo, along with ranch lands farther out, was a leader in bringing the Santa Fe railroad to San Angelo and in development of farming and irrigation activities along the Concho rivers. The town of Miles was named for the family, and a second Runnels county town, Rowena, was named for a sister of Jack Miles. This is his story. It is said that Lee county people have a language of their own. In a study of local phraseology, a knowledge of the locality is essential to easy tracing of some word or term to a particular race, or linguistic group earlier inhabiting that area. "Great big gormin boy or girl,"—an over-grown young person. "The out-kitenest fellow,"—unusual, ingenious, original. "A plum, or right sightly place,"
"Quite a spell aforehand, "—some time before. "Fetched and tote,"—brought and carry. "Catchin' weather,"—kind thought to foster spread of disease. "Mosey,"—go; "I'll mosey on now." "Her'n or his'n,"—hers or his. "A noggin"—small amount of drink. "Right folksy, or plum folksy," friendly, or sociable. "Fash,"—fret, or agitate, as "don't fash yourself." Mentions: Fletcher of Giddings * Ephriam Roddy, Tanglewood, a small town on the S. P. railroad. Renne Allred, Sr., of Houston, father of former Governor James V. Allred * the Bellaire Cafe * Mr. and Mrs. Charles Nelius, Mrs. Joe Smith, Mrs. R. H. Gallier, Walter Hasted, Mrs. Charles Cronemeyer, W. H. Redfield Chas. Moulds, Harry Goode, G. E. Little, Mrs. J. D. Borland, Mr. and Mrs. Emil Miller, Leon Moreau, Mrs. H. Z. Kelly, Mr. and Mrs. W. L. Chaillot, H. H. Alexander and Fred Stillman. Also aiding in the plans were Mr. and Mrs. Ira D. Brown, Jr., W. C. Arthur, C. F. Brown, Mrs. C. E. White, Miss Ethel Moebes, C. F. Stan-ford, Mr. and Mrs. Worth Jones, Mrs. Margaret Feagin, Mr. and Mrs. Guy Gibbs, W. Kirkland, Dr. Bob Renfrew, Mr. and Mrs. Earl Guillot, Wesley Nelius, Vera Downey and John Mallrath." Documents are searchable individually or you can search the entire collection by a word or phrase. I immediately identified a dozen articles pertinent to my current projects without trying too hard.